If you're worried about the security of your office, and you're looking to control who enters your offices, then our Office Entry Systems could be exactly what you're looking for. Our Door Entry Systems can control a single internal door to a fully computerised multi-site network of control points, whatever your requirements are we can provide the solution. The systems we supply can be used to control internal and external electronic, and magnetic door release and devices, that can only be operated by contactless smart cards, key fobs, or biometrics; giving you full control on who can gain access through the control points at any time of day. Our office door entry systems incorporate all the latest convenient technologies, ensuring that your employees feel secure as possible. Our access control systems are sourced from a number of great leading British and European manufacturers and when choosing our suppliers, we always keep the customer in mind, ensuring that each and every customer receives a secure, user-friendly system that is suited to their needs. Whether you're looking for a hands-free door entry system, a console with audio/visual capabilities, or something even more advanced than that, we're confident our access control experts will get the job done. If you're interested in purchasing an Office Door Entry System, please contact us to request a quotation. As a business owner, the security of your business should be very high on your list of priorities, and that goes double if you are running a small business. Break-ins, thefts, and fires cost businesses millions of pounds every year, so installing small business security systems to your premises is a very wise move indeed. Installing an intruder alarm is a good security measure for a small business to take, but not all intruder alarms are created equal. To get the most out of your alarm system and the money you invest into it, you will need to ensure that your security system is managed effectively by a group of experienced experts. Here at IDS, we offer a 24-hour monitoring and engineering service, providing you with peace of mind no matter what happens. Not only can our state-of-the-art intruder alarms detect unauthorised persons on your premises, they can also monitor for personal attacks and fires. If any of these things occur on your premises, we’ll ensure that the relevant emergency services are informed making this a wise choice for a small business security system. If you haven’t considered doing so already, now is the perfect time to invest in a CCTV camera system for your business. Surveillance technology has come a long way in recent years, and we continually analyse the latest developments to ensure that our customers are always protected by the most up-to-date technology on the market. Every year, businesses sustain millions of pounds’ worth of damage due to fires. As a small business owner, it is your responsibility to ensure the safety of your employees; it is also very much in your best interest to keep your building (and the assets inside) safe from fire. 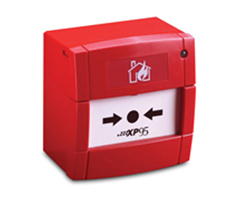 We design, install and maintain a huge range of fire alarm solutions for small businesses across England and Wales. We are able to cover all categories of fire detection systems, from conventional formats through to complex multi-faceted systems. Access control systems are extremely useful as small businesses security systems. These systems allow access only to authorised persons past a certain point - ideal for companies that deal with sensitive and/or confidential information. 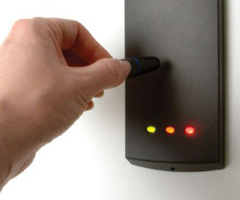 IDS are able to supply and install a wide range of access control systems, from internal doors through to full computerised multi-site network of control points. Not only do we utilise the latest technologies (such as key fobs, smart cards and biometrics), we can also fully integrate your access control system to your alarm and/or CCTV systems to provide you with a truly comprehensive security system for your business. Would you like IDS Security to provide you with a small business security system? Call us today on 02920 753 251, or email admin@ids-securityltd.co.uk to request a quotation. UK employers are required by law to provide a safe workplace for their employees. One of the most crucial considerations for a business owner is fire safety - fires cause countless injuries and fatalities every year, and many of these incidents occurred in offices and other workplaces. As an employer, your fire risk assessment will supply you with a number of different safety measures that you'll need to take in order to protect your staff from the risk of fire-related death or injury. Under the fire risk assessment, you must provide easily accessible fire exits, making sure that these points are clearly labelled and kept free from obstructions; you must also ensure that your workers know what to do and where to go in the event of a fire, as well as keeping fire extinguishers in the building in case a blaze breaks out. Why does my office need a fire alarm system? Of course, even if the list above doesn't convince you, there's one even more compelling reason to install a fire detection system in your office: it will ensure that you meet the requirements of The Regulatory Reform (Fire Safety) Order 2006. As the excerpt suggests, every workplace must have some kind of fire detection system in place, but the exact requirements vary depending on a range of different factors.